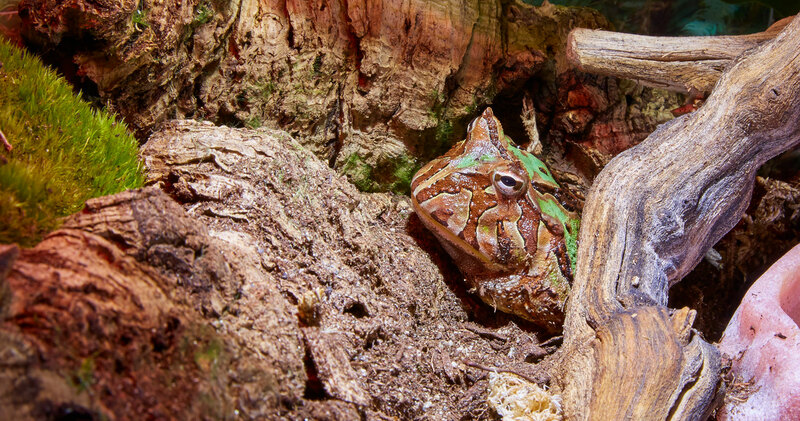 Pac Man Frog | Zoo Med Laboratories, Inc.
Ornate Horned Frogs are large voracious frogs that inhabit the forest floor of Colombia, Venezuela, Brazil, Argentina and surrounding countries. These interesting amphibians live a sedentary life and do not need a lot of space. Ornate Horned Frogs are ambush predators and will lie in wait for anything that will fit in their mouths. They are nicknamed Pac Man Frogs because of their enormous mouths and overall rounded shape. Despite their large size, Horned frogs are relatively inactive and do not need a lot of space. A young Horned Frog can be kept in a 5-10 gallon terrarium. A single adult frog can be housed in a 10-20 gallon terrarium with a screen lid. Provide plenty of cover by using Zoo Med’s Naturalistic Flora, Bush Plants, and Cork Rounds. Horned Frogs are tropical animals that will do best in temperatures from 75-85°F. No basking area is needed. Eco Earth® is the preferred substrate for Pac Man Frogs. We recommend keeping a deep layer of 3″ or more to allow your frog to burrow completely under the substrate. Avoid using large gravel in your terrarium. Pac Man Frogs can be aggressive feeders and will experience impaction if they were to swallow gravel. Zoo Med’s Terrarium Moss, Frog Moss, and New Zealand Sphagnum Moss are excellent choices of “substrate toppers” to retain humidity in your terrarium. Pac Man Frogs are true opportunists and will aggressively feed on any small animal or insect that fits into their mouth. A varied diet of insects and an occasional small mouse will provide a nutritious diet. Zoo Med’s Can O’ Insect products are an easy way to diversify their diet. We recommend feeding insects that are no longer than the width of your frog’s head. Dust insect items with Zoo Med’s ReptiCalcium® as directed. Clean, fresh water is critical to keeping all amphibians healthy. We recommend using ReptiSafe® Water Conditioner to treat all water that is added to your terrarium. A Little Dripper™, HabbaMist®, Repti-Fogger™, or Motomister™ can be used to add humidity to the enclosure.